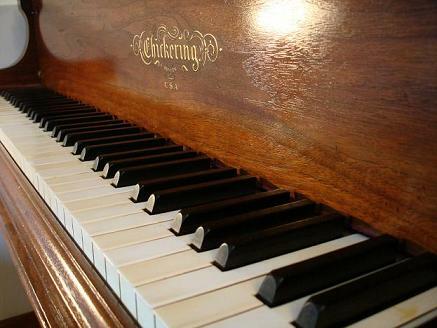 Chickering & Sons, Year 1926 / 1933, 5'4" artcase mahogany grand serial# 142085 / 151773 - - - Status: Restored. In showroom. This lovely Chickering & Sons artcase mahogany 5'4" baby grand with cabriole legs was first built as serial# 142085 in 1926, apparently with an Ampico A player system. It was then factory refitted with a drawer-mount Duo-Art player system and renumbered as #151773 in 1933, during the great depression and after the merger of Aeolian and Ampico. The piano was received by Historic Pianos in 2005 in poor condition both musically and in appearance. The instrument was barely playable with very worn hammers, loose action centers, damaged ivories, and an unattractive black spray-paint finish over the original mahogany veneer. The unprofessional paint job had left overspray on strings, stringplate, tuning pins, and action parts. The intrument was completely restored at Historic Pianos, completed in 2008. The case was stripped to expose the original mahogany and refinished with a gloss oil finish. The player action was fully rebuilt, with new pneuatic cloth on the stack and striker pneumatics, and on the Duo-Art expression box and all other control pneumatics. The piano was unstrung to allow for soundboard repair, pinblock replacement, and strinplate regilding. The soundboard was repaired to achieve factory-new integrity and crown, with ideal downbearing after restringing. The piano was restrung with a newly fitted Bolduc pinblock, German-made #2 blued tuning pins, new custom bass strings, and new stringing and damper felts. The action was fitted with new hammers and shanks, with tapered, coved and shaped hammer tails to reduce action weight, and the hammers were voiced to a very uniform, mellow tone for which Chickering pianos were prized. The original ivory keyboard was cleaned and a few damaged ivories were repaired, restoring the desirable feel, beauty, and elegance of the original ivory keytops. The action was completely regulated, including advanced key rebalancing for an ideal, uniform medium touchweight that allows for both expressive hand-playing and for high-fidelity reproduction of historical artist performances with the restored Duo-Art player.